On the 17th day of March, Irish people celebrate the feast of their patron saint St. Patrick. But aside from the Irish, people from all over the world also celebrate this day, not because of religious beliefs but more so as a cultural event. During such day the streets will be filled with green and colorful decorations, from green clover leaves, images of green Leprechaun, a pot of gold at the end of a rainbow, the Celtic knot, and so on. 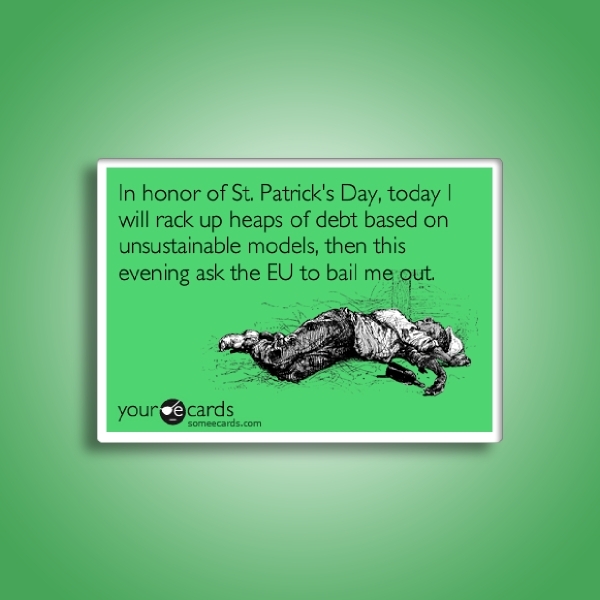 St. Patrick’s Day is a festive time, and people will want to send greetings through the use of a card. We have provided various downloadable types of cards that you can use for the special day. You may know people from the Irish community where you’re from and you may want to send them special greetings to celebrate the feast of the patron. In that case, you should choose a greeting card that sends well-wishes to the recipient in an aesthetically pleasing manner. 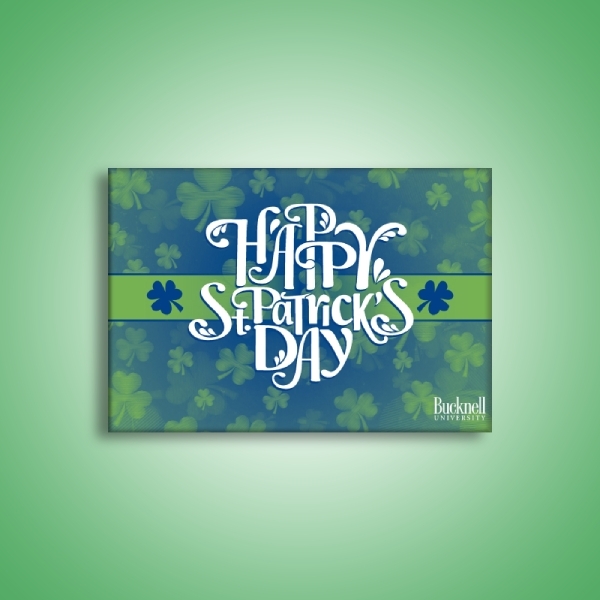 With this, you can download this St. Patrick’s Day greeting card template that uses high-quality images relating to the event, simple and direct layout, and original artworks. This template is free for download and is easily editable. 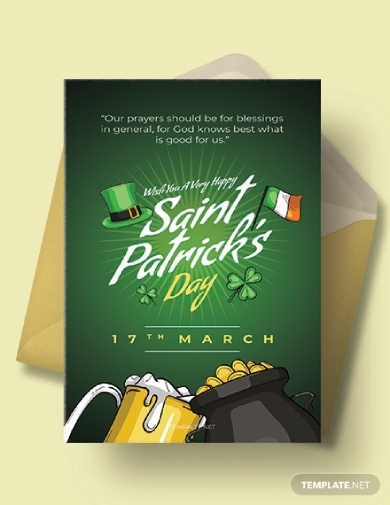 Contrary to the template above that focuses more on the design elements and illustrations, this St. Patrick’s Day card example focuses on the text elements. It features a good-hearted greeting that will surely be appreciated by the reader. It has also strategically used some of the symbols used for St. Patrick’s Day such as the Celtic knot and clover leaves as the borders and main design element. If you are planning to make a card to send some well-wishes, you can take inspiration with how this example perfectly balances the texts and design elements. The four-leaf clover signifies good luck according to the Irish traditions. Each leaf symbolizes good omens for faith, hope, love, and luck for the people who find it. Thus, it goes without saying that during St. Patrick’s Day, using the cloverleaf as the main symbol to express how lucky you are to meet someone should be obvious. 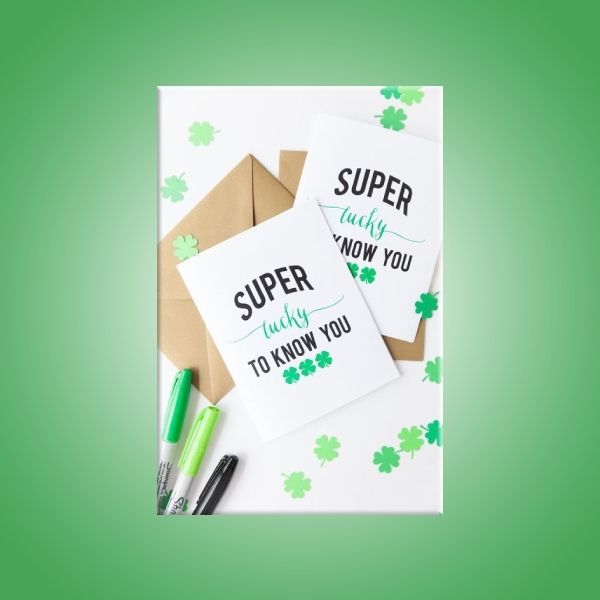 Like in this card example, the designer used the meaning of a four-leaf clover to express his/her appreciation for the recipient. You can use this card as a guide when you want to make a cute and fun card to give to your friends and loved ones. As a business owner, you should know how to successfully use any event as leverage to increase your revenue. Thus, using a gift card during St. Patrick’s Day where people may want to spend the holiday shopping is a wise business decision. 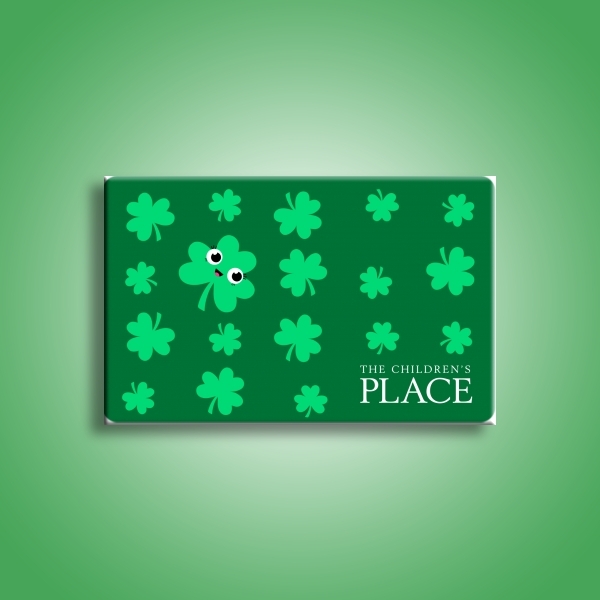 Looking at this St. Patrick’s Day gift card example, you can see how consistent the design is to the overall aesthetic of the event through using the color green as the background and using clover leaves as the main design element. Postcards help you remember the memories you’ve had in certain places. It can also be a good alternative to a greeting card when you want to send greetings to people who live far from you. 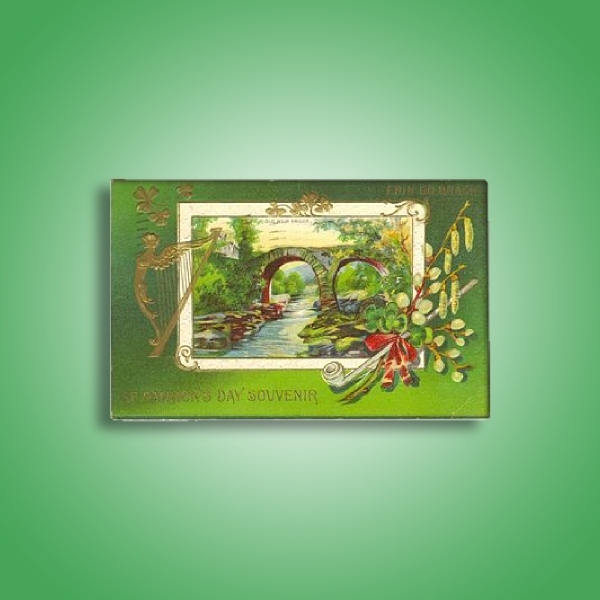 In this St. Patrick’s Day postcard example, it uses the shamrock that is a symbol used for the feast that ties back to the holiday’s religious roots, the harp and the color green that ties everything back to the feast of St. Patrick. You can use this example as a guide on how you can maximize the use of each symbol without making the surface too blank or too overcrowded. This generation has been using memes to express sarcastic and sometimes too realistic feels. Memes use funny images and phrases to convey a message and somehow aim to entertain the receiver. 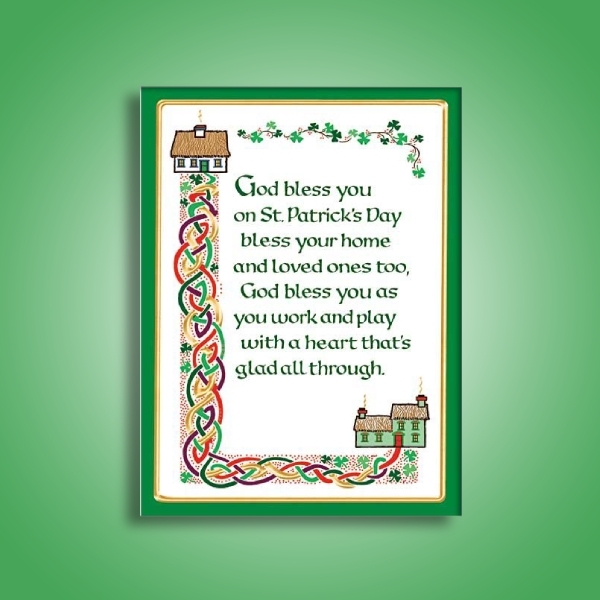 To steer away from the common cards that one may use to send well-wishes, you can use a meme card to convey a fun and ingenious greeting to your friends and family during St. Patrick’s Day. You can make your own meme by simply choosing an image that conveys the feels you want your receiver to feel with the text you include. Aside from being a religious event, St. Patrick’s Day has become an event that allowed students to go out an enjoy fun times with friends. If you want to send greetings to your friends or even teachers, you can totally do so with the use of a good card. This card example is the perfect card to give as an elegant greeting card to friends, family, colleagues, etc. It uses classic green shamrock leaves as the background with an intricate and elegant font style. Since St. Patrick’s Day falls on the month of March, schools have incorporated this event to the lesson or materials that they use. 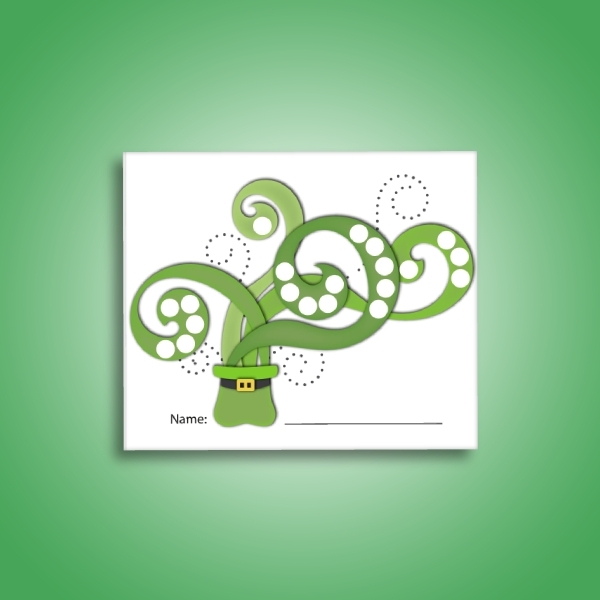 Just like in this motivational point card example, the iconic leprechaun hat is used to collect the stars or rewards that kids get for their lesson; it functions similar to a report card that records the kid’s performance at school. And since the leprechaun is usually viewed as a cartoon character, kids will surely want to fill its stems or branches with stars to achieve the main prize. Disney is still one of the most profitable business in the world and this is because they know how to make good business decisions. 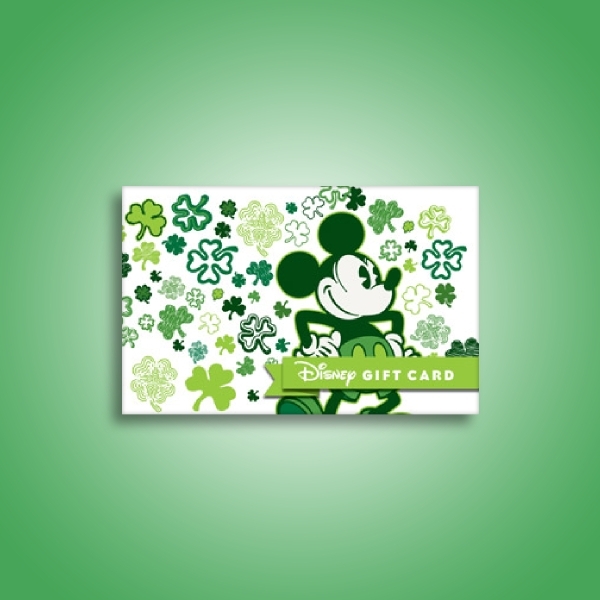 In this Disney St. Patrick’s Day gift card example, the icon for Disney, which is Mickey Mouse, is used as a design element along with the green clover leaves that represent St. Patrick’s Day. Disney has offered good deals and promos with this gift card that will surely encourage people to purchase the products and/or services that they offer. As a restaurant, you should know how to take advantage of this event. You can make a new menu that features dishes especially made for St. Patrick’s Day. 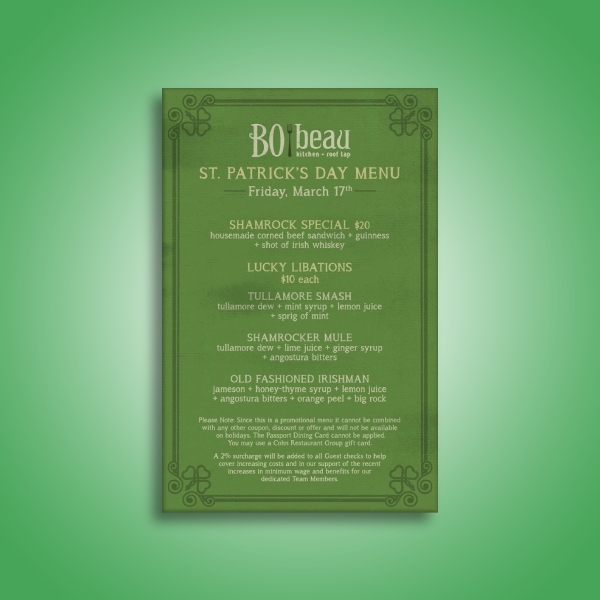 Take a look at this St. Patrick’s Day restaurant menu example, you can see how the background sticks with event color green and the border design feature the traditional shamrock. The names of the dishes also pay homage to the origin and message of the event. Aside from all the party shenanigans, this whole event can be used as a learning tool that will teach kids about various important lessons. 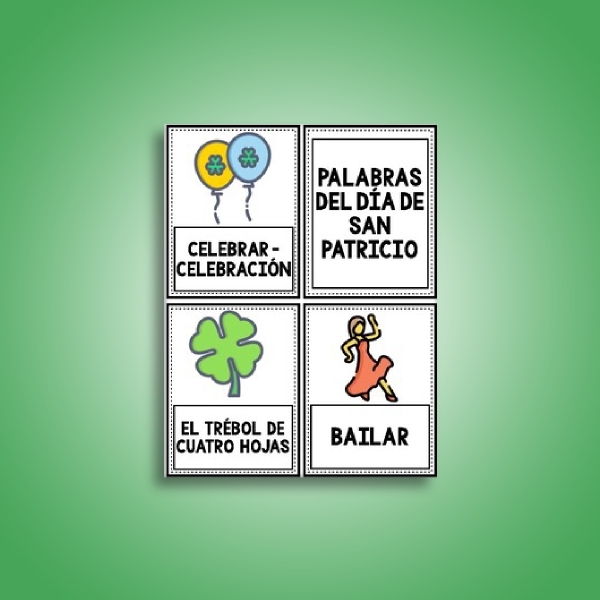 For example, this St. Patrick’s Day-theme words card teaches children of the English and Spanish terms that are commonly used to describe or relate to the event. If you are in the academe or simply want to try something new to teach your own kinds, you can take inspiration and motivation from this holiday card example.